We managed to get a couple more cms of snow overnight and there was a light snow for most of the day. I went up for a few runs and it was really nice. No deep powder but I did my first run of the year on "double header" and also "race place" which are basically on the opposite ends of the resort and they are really nice all the way to the bottom. The conditions for this time of the year are really good. Mind you if we had some busy days, it may change quickly but that shouldn't happen until just before Christmas. Lots of time for a good dump of snow. Here is first video of the ski season from Friday dec. 9th. Fabulous Day in paradise today. Temperatures stayed nice and cool. Probably about -10C for the most part and blue-bird Sky's. And with about 15 cms of new snow over the past few days and nobody on the hill, it doesn't get much better. Consistent snow from top to bottom. I took some of our guests out for a couple runs. Paul Sacco and his friends from Vermont and Ray from Australia who is with us for 8 days. He is going to be in for a treat, because the weatherman is calling for more snow this weekend. Finally got all the snow shovelled. Need to hire someone to do the roof though. Not me. Can't believe the people who made it to the mountain this morning despite all the roads closed. Jammed. I think I will give it a pass. Great two days. I don't need to stand in line. We had some guests who rolled in last night from Calgary. They actually did pretty well. They left at about 5 and were here by 11pm via Radium. That is the only road still open. Highway from Revelstoke is closed and so is the transcanada to Calgary until at least tomorrow tuesday. Avalanche danger. Here are some photos from the past few days. Snow Predicted for Kicking Horse. Snowing lightly most of the day. I went up in the afternoon for a couple runs. Terminator was really nice with nice fresh snow. They are calling for about 20 cms over the next couple days. Maybe the busiest day so far this season but really not much of a lineup. We still have a couple rooms available for New Years. Give us a call or tell a friend. $275 per night double occupancy. 3 night minimum. One of the great things to do in the area is snowshoeing. You can go right from our door and make trails anywhere in the trees. Along with son Kori and his fiance Elaine that is what we did yesterday. It was a fabulous afternoon. A lot of solitude. Some low cloud cover in the morning here at Kicking Horse. I went up about 1pm with a neighbour Bob for a few runs. It was actually quite cool at the top with a bit of a breeze and temperatures about -15C. I didn't really come prepared for the cold temperatures. As long as you were moving it was okay, but the chair ride was longer than I wanted. Snow conditions at the top is really nice. We had some powder a few days ago and it hasn't been very busy so still some nice soft snow and I was surprised by how quiet it was on the hill. I guess everyone is Christmas shopping. There is supposed to be some snow coming in a couple days. Reminder if you are looking for a New Years trip, we still have a couple rooms left. The resort always has some special events planned with a nice dinner and live music at the top of the mountain and fireworks in the plaza area. Woke up to about 8-10 cm of fresh snow and it kept snowing all day. The skiing got better and better as the day progressed. Another Ski Season Kicking Off at Kicking Horse today. We had 32 cm of fresh snow over the past couple days. And then the sun came out. You can't ask for more. You still have to be careful until it gets skier packed. I was maybe overly cautious but it doesn't take much to catch a ski on a rock just barely under the snow. It is a long season. Pretty quiet for opening day, but I suspect tomorrow will be a lot busier. Kicking Horse is opening Early. Just found out this morning that Kicking Horse is opening Early. They are going to open on December 3rd, 4th and 5th. Then close for a few days, and reopen for the Season on December 10th. More snow is predicted this week so it should be an awesome start to the Season. Contact us for "First Tracks Special" here at Vagabond Lodge at Kicking Horse. Great day yesterday. Taking advantage of quiet-time. Took Helen our wonderdog for a walk in the woods on Snowshoes. I had the Snowshoes on. Helen was on her own. Fabulous time. Just a few minutes away from Vagabond, we bushwhacked our way through the woods. 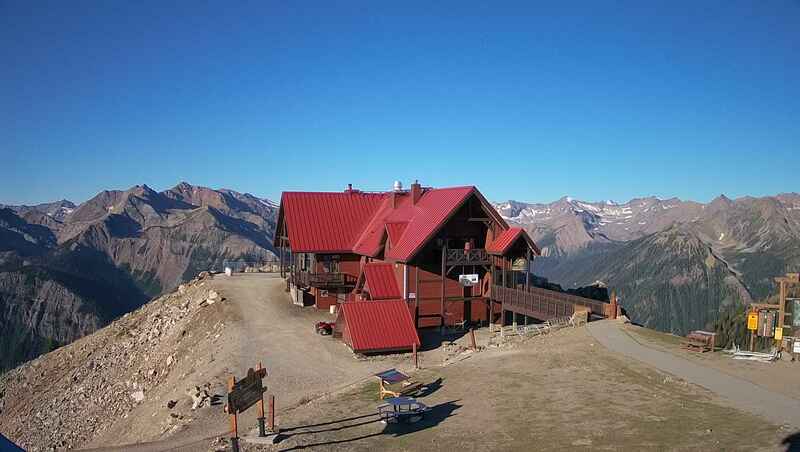 Ken along with his wife Lori are the owners and operators of Vagabond Lodge at Kicking Horse Mountain Resort. Click on Photo to go to Vagabond Lodge Website.